Sally Field’s debut book In Pieces is a New York Times Notable Book of 2018. In this hauntingly intimate literary memoir, American icon Sally Field tells her personal story for the first time. She shares about her lonely and challenging childhood. She tells how she found the craft that helped her find her voice. She relays what a powerful emotional legacy she had that ultimately shaped her journey as a mother and a daughter. With honest, fresh and perfect-pitched prose, Sally Fields write with all humility and authenticity that her fans have expected from her. She brings the readers to the highs and lows of her early career in star-studded Hollywood. In Pieces is a powerful and unforgettable inspirational account of a woman’s life in the second half of the twentieth century. 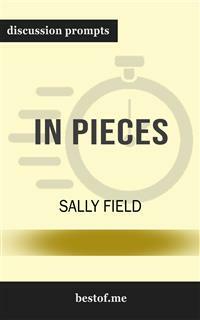 In this comprehensive look into In Pieces by Sally Field, you'll gain insight with this essential resource as a guide to aid your discussions. Be prepared to lead with the following: Discussion aid which includes a wealth of prompts and information Overall plot synopsis and author biography Thought-provoking discussion questions for a deeper examination Creative exercises to foster alternate “if this was you” discussions And more! Disclaimer: This is a companion guide based on the work In Pieces by Sally Field and is not affiliated to the original work or author in any way. It does not contain any text of the original work. If you haven’t purchased the original work, we encourage you to do so first. Have you ever wanted to improve your understanding of In Pieces? Or perhaps you are simply struggling to learn the subject matter? It’s a simple teaching technique that helps students learn and readers to grow. With versatile discussion questions for each major criteria regarding In Pieces, these discussion prompts are designed to help surface crucial discussions that are capable of assisting toward thinking and learning on a deeper level. Whether you’re an avid learner set out to reach the best for yourself, or a student struggling to learn the subject matter, these discussion prompts can get you to actively respond as your question, analyze, relate, and reflect.